Creamy Asparagus soup is a comfort and delicious soup prepared using onions and asparagus. I have used both butter and olive oil for sauteing but either one can be used. Butter sauteed veggies and Mozzarella cream gives a rich flavor to the soup. Very healthy, creamy and filling breakfast when it is served with Toasted bread or Croutons and salad. 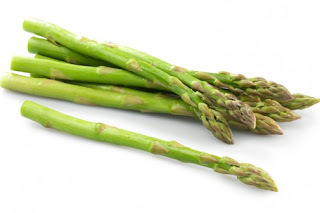 Asparagus is a spring vegetables which is often served as stir fried along with chicken, beef or shrimp. Apart from this, soup, stews etc can also be prepared. This is one of the diet friendly veggie as it is low in calories and low in sodium. This is also a very good source of dietary fibre, vitamins, calcium, folic acid etc. Heat butter in a pan and add olive oil followed by the finely chopped onions. Saute it for a minute in a medium flame or till the color changes to light brown. Add the chopped Asparagus and saute it for a minute. Now add chilli powder and salt. Mix well and cover it for a minute. Add 2 cups of water, simmer the flame and cook it for 20 minutes or till the Asparagus gets cooked and soft. Mash it with a backside of spoon or spatula to check whether the Asparagus has cooked. Once done, remove from the flame and cool it. Puree the cooked Asparagus and strain it using strainer. Add the pureed soup in a pan and let it boil for a minute. Now add the fresh cream and boil it for another couple of minutes. Add crushed pepper and adjust salt at this stage. Meanwhile, take 2 tbsp fresh cream in a small bowl and add Mozzarella cheese and Lemon zest. Beat well using fork and keep aside. Pour the soup in a serving bowl and top it with the Mozzarella cream. Serve hot with Toasted bread or Croutons.